Located in Vancouver, WA, Educational Service District 112 (ESD 112) is an agency that provides support services to school districts throughout the state of Washington and eight other western states. One type of service provided by ESD 112 is purchasing contact negotiation. If a school needs to purchase furniture or projectors, for example, ESD 112 sends out an RFP to vendors and manages the bidding process. This allows school districts to simply purchase from one of the approved vendors rather than manage the bidding process independently. For this to happen, a school district must sign an interlocal purchasing agreement with ESD 112. Prior to Laserfiche, managing these agreements was quite burdensome. Agreements must be renewed regularly, which requires additional processing. 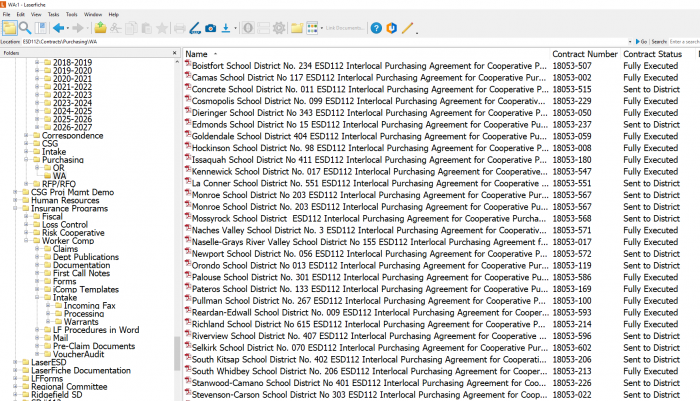 With 296 school districts in the state of Washington alone, and eight other states using this service, ESD 112 processed a high volume of agreements on a weekly basis. As many as 750 agreements were awaiting renewal, and new school districts request agreements regularly. 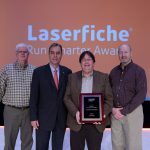 ESD 112 streamlined the submission, review and signing of interlocal purchasing agreements with Laserfiche Forms, Workflow and an integration with Signix e-signatures. Traditionally, staff spent approximately 45 minutes per contract. Time spent per contract was reduced by over 90%. 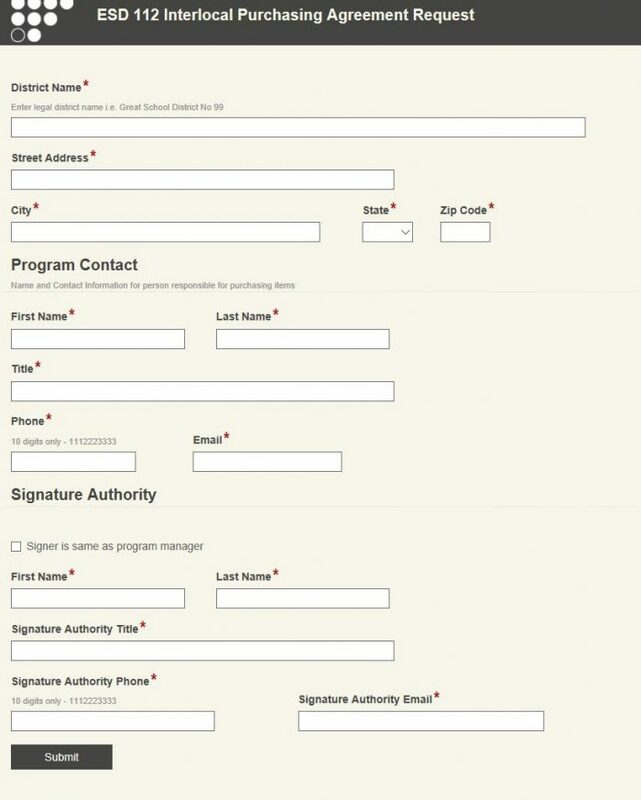 To submit an interlocal purchasing agreement, a district fills out and submits a simple Laserfiche form. Once this form is submitted, it is automatically routed to the accounting department for review. Accounting staff reviews the submission to ensure that it is valid, and verifies that there is no existing interlocal purchasing agreement on file. If the form is filled out correctly and the request is valid, accounting staff approves the request. 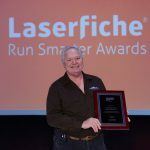 Laserfiche Workflow populates a PDF interlocal purchasing agreement template with the data from the form. It then adds fields to the PDF to turn it into a fillable PDF form. Workflow sends an email to the district representative with a link to this agreement document in Signix. 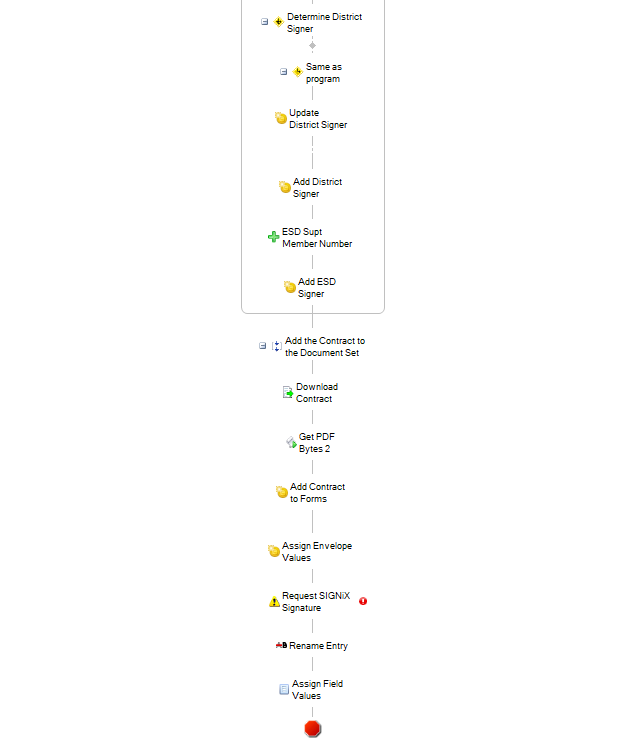 This is done using a custom Workflow activity developed for ESD 112 by Cities Digital. A notification email is also sent to the purchasing coordinator, alerting them to be on the lookout for the signed contract. Workflow files the unsigned contract in the repository and applies metadata. The representative signs this agreement in Signix and sends it back to ESD 112. Once the signed contract is returned, Workflow replaces the unsigned copy with the signed copy. It then sends a notification to the purchasing department. The purchasing department can run a report in Laserfiche Forms at any time to see the contact information for interlocal purchasing agreements. If the employee chooses to create a contract report, he is prompted to fill out a Laserfiche form to select what contracts he wants to see. When he clicks submit, information from the form is passed to Workflow, which automatically generates a report and emails it to the requestor. Time spent processing each agreement has been reduced by 90%, from 45 minutes to just a few minutes. Output has increased significantly, as 25 agreements have been requested, reviewed and signed in the first two days of introducing this process. Mailing costs have been eliminated, and contracts are executed more quickly.